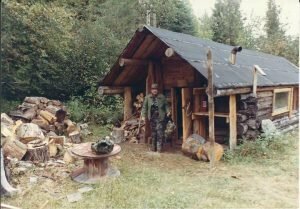 This is my bear hunting story. It was a tense experience, but humorous afterward. 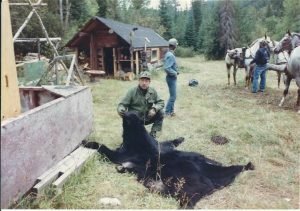 We were in BC Canada elk & bear hunting high up in the Rockies. There were six of use but in my group there is myself, my hunting partner Thomas, a dentist from Gray Georgia, plus our guide. We were are all on horseback, for no motor vehicles were allowed in the area. On that day we are up high in the mountains looking for signs of elk. As we rode along, I looked over on the next mountain side and see a large black bear. 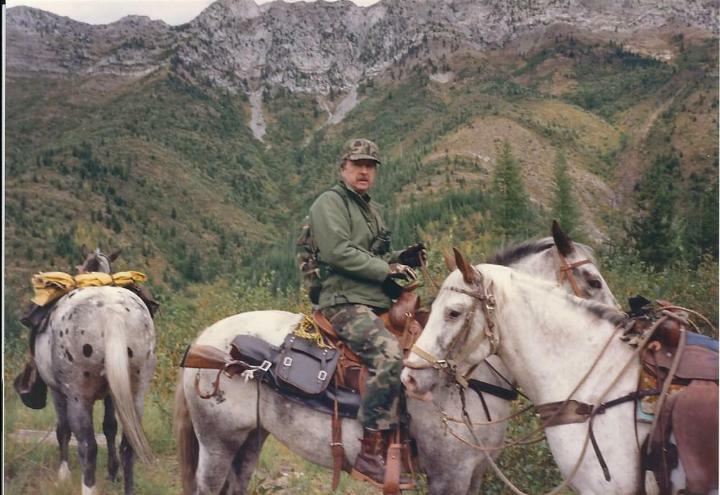 (Thomas had first shot at an elk and I had first shot at a bear) The guide now sees him also. I had a tag and he ask if I wanted to take it, I told him yes. I dismounted. 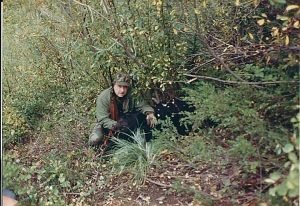 I pull out my Colt Sauer .300 Weatherby mag, with 3-9 Leupold scope from my scabbard and selected a firing position,, I estimate 275 to 300 yards. I sat down and used a fork in a small tree to brace my rifle, I take aim, BANG! Bear go’s down. Guide says nice shot. We stand there figuring the best way to get around to the bear. Next thing we see the bear getting up and running into a good size patch of tall mountain laurel brush. I am now real disappointed in my shot. It takes us about 20 minutes or so to work our way over and around to the patch of laurel brush which is about 14 feet high. It is very thick and you cannot see very good inside. The patch is about 40 yards by 30 yards and dark inside. We have a wounded bear to locate. Guide says “Somebody has got to go in”, my partner Thomas quickly says, it ain’t my &%$# bear. I replied, it’s my bear I got it. I start in and realized you cannot see anything more that 8 feet, the stuff was so thick. Plus, I have a rifle with a scope on it, no open site. Check out the best scope for 6.5 Creedmoor. I dialed the scope down to 3. About that time things start rushing through my head like wounded bear thoughts and how pissed off he must be and will charge at the snap of a twig. Well, I keep moving into the brush and about that time I hear the guide shout, THERE HE IS, HERE HE COMES!! My rear end is climbing up my back at this time!! I think to myself, coming from where? Oh crap! I don’t dare answer back and give away my position to the bear. 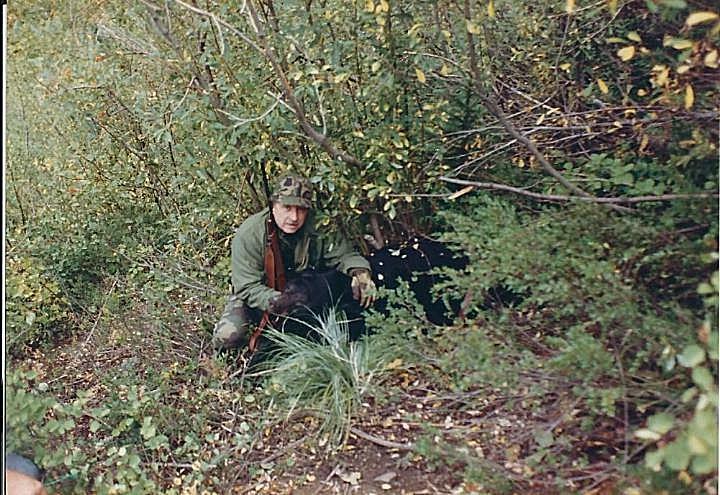 A few seconds later I see the bear (like a shadow) moving from my left to my right; I turn, I pick him up in the scope, he is so close that the scope picture is out of focus but clear enough to see the bear and know it is a bear, I aim and take my shot. BANG! He went down and stayed down this time. Standing over the bear my knees felt weak. We were located on a sharp slope; the bear went down near a big drop off angled downward into a ravine. When I say drop off, I’m talking straight down!. Way down! We had to hold onto small trees while dressing out and skinning the bear. On the last cut the carcass took off down the mountain over the edge into the ravine far below. Now to top this off, when we got back to the horses, none of the horses would allow the bear head and hide on board or near them! 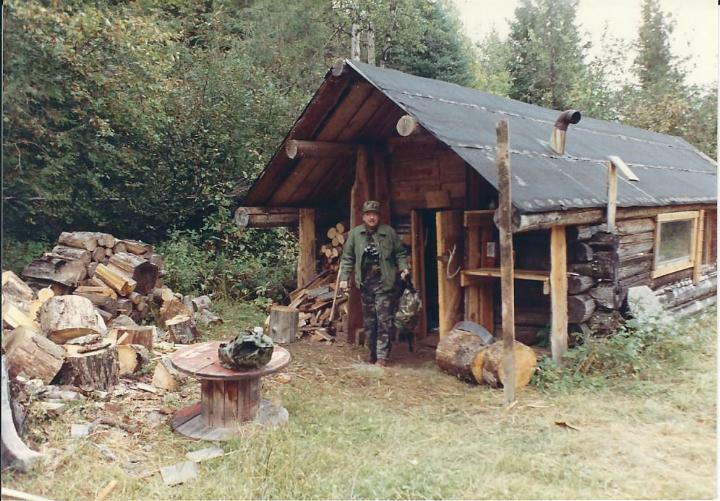 I put my rifle in the scabbard and the guide lead my horse while I carried the hide with head draped over my shoulders all the way back to camp. Little over a mile. Well, I now have a beautiful 6 ft black bear rug in my den. It was an exciting hunt. One I will never forget!